Omar, the red fox, always seemed to be hungry. He’d eat almost anything, but his favorite food was ostrich. A lot of ostriches lived on the outskirts of Amman, Jordan, and this morning, Omar had his heart set on one for breakfast. He crawled out of his den into the surrounding bushes. Crouched and hidden, he waited for an ostrich to pass his way. He didn’t have to wait very long. After only a few minutes, the biggest ostrich Omar had ever seen came running by. Omar jumped from behind the bushes and chased Tareef over the hill. Tareef ran down as fast as his two powerful legs would carry him. 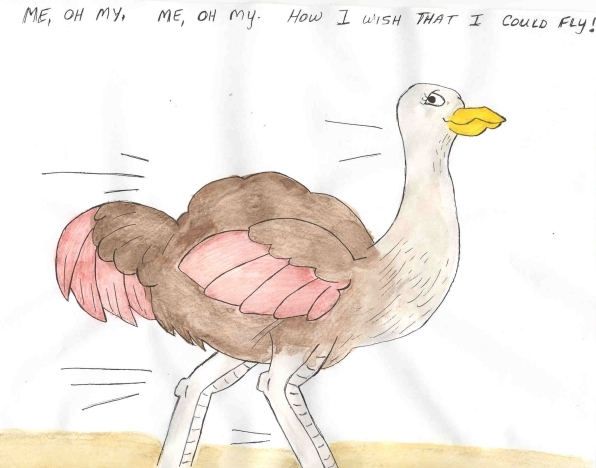 Everyone, including Omar, knows ostriches can’t fly. Glancing over his shoulder, Tareef huffed and puffed, crying, "Help! Omar is after me! Somebody help me! Oh me, oh my. Oh me, oh my. How I wish that I could fly!" He ran towards the city that lay spread out before him. He could see it shimmering in the morning sun. The houses and other buildings that fanned out across the hills of Amman looked as white as glittering snow. Tareef looked around. Omar was running towards him. He tried to find a place to hide. There were no trees, just small bushes that were no good for an ostrich to hide behind. He picked up the pace and ran faster. One or two of his fluffy tail feathers flew out and went fluttering into the air. "Oh me, oh my. Oh me, oh my. How I wish that I could fly!" Tareef gasped for breath. He was tired of running. He spotted a cluster of eucalyptus trees growing beside a bubbling spring. "A spring!" he shouted. "I think I’ll hide over thee." He found the fattest tree trunk he could see. Standing straight and tall, Tareef hid from Omar. He didn’t realize that his fat, round belly poked out, as did his tail feathers, but he felt confident that Omar wouldn’t see him…and he didn’t. Omar ran right past the spring. When Omar disappeared, Tareef came out from behind the eucalyptus. He breathed a sigh of relief and then walked over to the spring for a drink. He lowered his long neck and sipped the cool, refreshing water. He saw a sign that explained how Amman used to be known as the ‘City of Water’ because of all the springs. Tareef paid it no attention and headed for the city. He walked to town like he didn’t have a care in the world, but had only gone a short distance when he heard a familiar growl behind him. He turned and saw the fox standing there. "Yikes!" shouted the ostrich. He ran as fast as his long, strong legs could move. "Oh me, oh my. Oh me, oh my. How I wish that I could fly!" He searched for safety among the crowded streets of Amman, sobbing as he ran about. He turned to the left and then turned to the right, but no matter what direction he went, Omar followed him, growling with hunger. He turned to the left again and came upon the souk. There were hundreds of stalls and small shops lining the narrow streets. Surely he could loose Omar in here. He disappeared among the crowds. Tareef struggled for breath. He lifted his long neck and all he could see in front, behind, and to the sides were stalls. Many goods were for sale – gold chains, necklaces, bracelets, and rings sparkled as the sun’s rays danced off them. Tareef was dazzled by the shiny gold chains. "If I had one of those, my neck wouldn’t look so long," the ostrich muttered. He pulled one off the rack with his beak and slipped it over his head. He giggled as it slid down his long neck, bouncing when it hit his plump belly. "No, I don’t like this after all," he said and put the chain back on the rack. Realizing he’d forgotten about Omar, Tareef said, "I wonder where the fox is?" He stood up tall so he could have a better look about the souk. He spotted a stall that sold many brightly colored scarves. Growl. He heard that familiar snarl again. There stood Omar. His reddish-brown fur stood up on his back and his bushy tail stuck up behind him. "Where can I hide?" Tareef gulped. He ran as fast as his thick legs would go. "Oh me, oh my. Oh me, oh my. How I wish that I could fly!" Omar chased the ostrich, snarling and growling behind him. Tareef came upon a stall draped with lace blouses. A few had feathers sewn on the collars. This gave him an idea. He climbed into the stall and hid among the blouses. He fluffed out his tail feathers and pretended that they were part of the blouse. He slipped his long neck into a sleeve and hoped Omar wouldn’t spot him. Luckily for Tareef, the fox went running by. Tareef stayed there for a long time, not moving until a woman pulled out one of his tail feathers. "Ouch!" he cried. The woman saw the ostrich and chased him away. At least Omar was nowhere to be seen. Knowing that the fox couldn’t be too far away, Tareef left the souk and headed towards the center of the city. He came upon a Roman amphitheater. It was built from large blocks of stone. There was a stage in front and rows of bench-type seats layering up to the top. Seeing that nobody else was around, Tareef walked onto the stage. He looked up at the empty seats and tried to imagine what it would have been like long ago when Rome ruled the country. He felt silly standing alone, but also dared to be brave. He opened his beak and started singing. His voice echoed off the stones seats and sounded rather nice. He finished his song and then took a bow. "Thank you. Thank you," he said to his imaginary, applauding audience. He was about to sing another song when he heard the familiar growling. "Oh no! It must be Omar," he whined. "I’ll go up there," he said, and ran up to the top of the amphitheater, hiding behind a large stone. He watched as Omar trotted onto the stage. Omar stood for a few moments and then sang; actually, it was more of a howl. Tareef snickered. Omar sounded horrible. The louder he sang, the worse he sounded. When he started howling, Tareef couldn’t stand it any longer. He burst out laughing, holding his round belly. That was a big mistake! Omar heard him. Suddenly the howling stopped and the growling began. Tareef stopped laughing and looked down at the stage. Omar jumped off and leapt at him. "Oh me, oh my. Oh me, oh my. How I wish that I could fly!" In despair he ran to the other side of the amphitheater, down the rows of stone steps, across the grass, and up another hill. Ahead of him stood ancient pillars and a sign that read ‘THIS WAY TO THE TEMPLE OF HERCULES’. An arrow pointed to the top of a hill. Tareef ran as fast as his prickly legs would take him to the ancient stone pillars. He glanced behind and saw Omar following. "Where can I hide? Where can I go?" He hid behind the biggest pillar. He stood very still, peeking now and then to see if Omar was near. Omar prowled around, sniffing for the ostrich. When Tareef looked again, he was shocked to see Omar standing near his feet. Omar growled. "Yikes!" shouted Tareef. He ran with Omar in pursuit. Growls followed him into the city. He ran down the street, having to dodge the fast moving cars. He ran behind a tall office building, but Omar found him. "Where should I go?" Tareef started to panic. He couldn’t loose the fox. As he ran past a stall selling fragrant Arabian coffee, the ostrich smelled kabobs. They were roasting on a spit, dripping juices. Tareef had a hard time resisting. "Yum, yum," he said, but kept running, knowing Omar was right behind him. He soon came to the grounds of the King Hussein Mosque. He slowed down to a walk, as everyone around him was talking softly and moving as slow as a snail. He knew he must be in a sacred place. He couldn’t see the fox and felt relieved. He tiptoed through the grounds. The mosque was white and shiny, with a blue roof. He sat under a tree and rested, tired from all the running. Closing his eyes, he dreamed of those delicious kabobs. Growling woke him up. "Oh no," he thought. He opened his eyes and there stood Omar, his eyes glaring. Tareef stood up slowly. Omar growled louder. Tareef knew he couldn’t run fast enough his time. "Oh me, oh my. Oh me, oh my. How I wish that I could fly!" He was too tired to run, so he did what any other ostrich would do; he stuck his head in the sand and hoped that Omar would go away. Omar stood in amazement. Did Tareef really think he was hiding by putting his head in the sand? 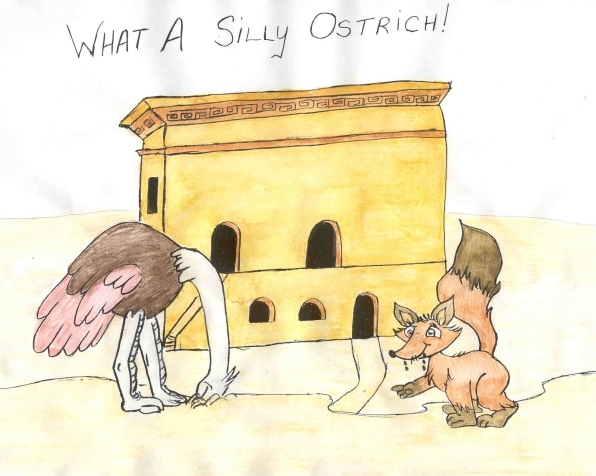 What a silly ostrich! Omar’s mouth started watering. He was hungry for a much awaited ostrich dinner. 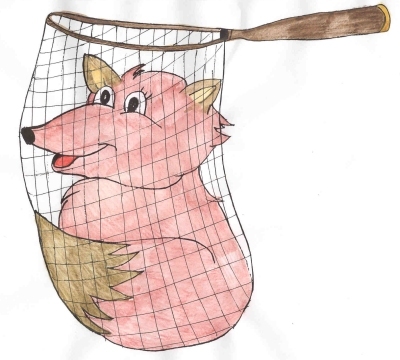 He was about to pounce on Tareef and eat him when a groundskeeper appeared and scooped him up in a net. Omar let out a loud howl. Tareef lifted his head from the sand to see what was happening. He watched as Omar was carried away in a net. "Hurray! Omar’s gone for good." Tareef was happy. He’d never have to run or hide again. As the sun set it filled the sky with orange, red, and purple blaze. "How beautiful," he sighed, and then headed back to the city center. He found the kebab stall and bought three of them. Under a jacaranda tree, the ostrich sat, eating his kebabs and drinking some Arabian coffee. Feeling satisfied, he smiled and headed back to the brushy hills, knowing he’d be safe from Omar from then on.